Tropicana Field in Tampa, home of Major League Baseball’s Tampa Bay Rays, will become the first sports venue in North America to be completely cash-free starting this year. Major League Baseball’s Tampa Bay Rays, along with hospitality provider Levy and tech firm E15, have announced that the team’s home ballpark, Tropicana Field, will become the first completely cash-free sports venue in North America, with all concessions, team stores, box office and other points of sale operating strictly without a cash option starting this year (parking at the venue was already cash-free last year). The Rays begin their 2019 regular season in April. Tropicana Field’s new cashless payment approach will launch at the Rays’ free-admission Fan Fest event Feb. 9, during which fans will be able to shop at the Rays Baseball Foundation’s Yard Sale as well as the Rays Republic Team Store and auxiliary shops. Several concession stands will also be open and will accept digital payments. The move follows extensive pilot testing by E15 at both Tropicana Field and other venues nationwide to measure the effects of cash-free transactions. They found that going to all-cash-free cuts average transaction time almost in half compared to environments that accept cash, thus producing faster moving lines and increased fan satisfaction. 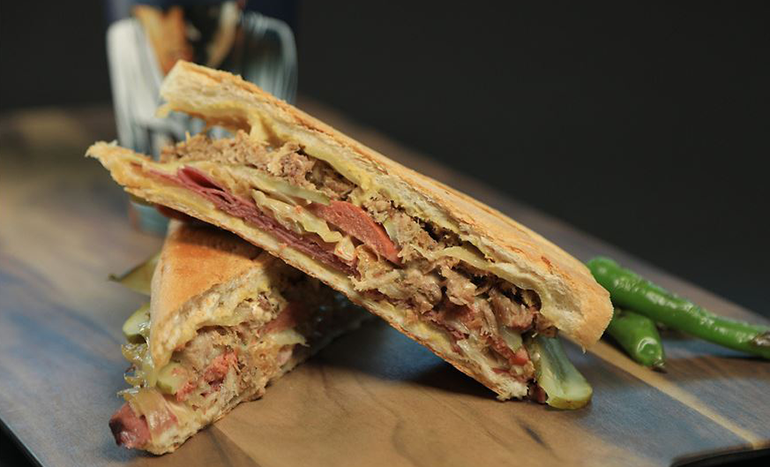 Concessions fare such as this Reuben Cuban sandwich from Tropicana Field hospitality partner Levy will only be available with cashless payment this coming Major League season. Meanwhile, a phased cash-free pilot implementation at Tropicana Field last year proved to reduce average transaction time by 50 percent and converted wait time at the ballpark’s highest volume stand from seven minutes to less than two minutes. Plans call for concession stands and retail stores inside Tropicana Field to accept major credit cards, Rays gift cards, Season Ticket Holder Rays Cards and NFC mobile payments such as Apple Pay and Samsung Pay. Fans lacking any of these options will be able to use cash to purchase gift cards in any amount at all retail locations and in $10 or $20 increments through roaming gift card vendors.